We have arrived cage side here at the Doubletree in Manchester, New Hampshire and are ready for the start of Combat Zone 68, the fight line up has changed slightly from our initial reports, Jake Pilla’s opponent Kenny Lewis is out and Pilla will now be fighting Matt Brady. Also another fight had been added to the card as Seth Basler takes on Lorram Esteves at a fight weight of 160 pounds, it also appears that the kickboxing match that was supposed to be the first fight of the night has also been scrapped. 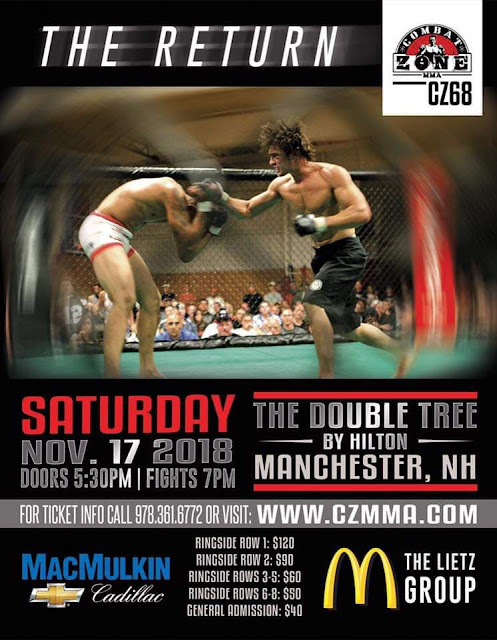 But we have 10 fights coming your way as Combat Zone 68 comes to you from Manchester, New Hampshire. Round 1: Spencer comes out and gets the quick takedown, Able works his way back to the feet before being taken back down, Able returns to his feet once again and Spencer catches him in a deep guillotine for the tap. Decision: Spencer Payne defeats Isaiah Able by submission due to Guillotine at 2:12 in round number one. Round 1: Marini comes out swinging and backs up Gadd to the fence, Marini grabs a standing Guillotine, Gadd tries to land body shots to release the guillotine but to no avail. Marini pulls guard and sinks the choke deeper for the tap. Decision: Alyssa Marini defeats Chrystal Gadd by submission via guillotine at 1:52 of round number one. Round 1: Jesus comes forward early landing a combination that buckles Meuse, Jesus grabs a guillotine and they go to the mat. Meuse uses the top position to his advantage and passes into side control and Jesus holds on not allowing Meuse to posture up. Meuse hops on the back and is looking to flatten out Cintron, Meuse gets him flat to the canvas and after a little conversation between the fighters Meuse sinks in the Rear Naked Choke for the Tapout. Decision: Gerald Meuse defeats Jesus Cintron by Submission via Rear Naked Choke at 3:09 of round one. Round 1: Marotte comes out throwing and backing Sanchez up with strikes, Marotte clinches up and lands some dirty boxing and is countered with some body shots by Sanchez. Sanchez is doing a decent job of countering from the outside. Then Marotte lands a shot that drops Sanchez to the mat; Marotte follows up with heavy ground and pound and elbows for the TKO stoppage. Decision: Brendan Marotte defeats Joey Sanchez via TKO strikes at 2:06 of round number one. Round 1: Parkinson comes out swinging and throwing kicks, Terrance grabs one of those kicks and dumps Parkinson to the ground and has top control. Terrance lands some nice ground and pound and short elbows from close quarters as he continues to work from the top. Parkinson reaches for one of Terrance's arms but Terrance continues to apply heavy top pressure to defend the arm. Terrance breaks the hold on his arm and works from Parkinson’s guard. Terrance postures up and lands some elbows from the top and Parkinson looks to pull him in close. 10-9 Terrance Jean Jacques. Round 2: Parkinson comes out in round two looking for some spinning techniques and Terrence closes the distance and gets the takedown and once again works heavy from the top. Terrance lands some nice shorts heavy elbows and Parkinson looks for the arm once again. Terrance once again breaks the hold on the arm and is punishing Parkinson from the top. Sharp elbows from Terrance have built up a large mouse on the forehead of Parkinson as he gives up his back to avoid and more punishment as the round ends. 10-8 Jean-Jacques. Round 3: Terrance backs Parkinson into the corner and picks Parkinson up and slams him with a thunderous single leg and again goes to work from the top landing elbows and ground and pound. Terrance walks Parkinson all around the cage staying on top and raining down punches and elbows that are causing severe damage to the face of Parkinson. Bryan Minor stands the fight up with one minute left but Terrance again takes it to the mat with a huge slam and we are back to top control and more beating from Terrance. 10-8 Terrance Jean-Jacques. Round 1: Basler comes out like he always does swinging for the fences, Esteves grabs an leg and dumps Basler to the ground and hops on his back from the Rear Naked Choke. Decision: Lorram Esteves defeats Seth Basler by submission via Rear Naked Choked at :23 seconds of round number one. Round 1: Brady comes out and backs up Pilla and gets the takedown, Jake transitions to top control, Jake allows Brady to return to his feet and lands a beautiful up kick from a hand plant position. Absolutely Amazing! Decision: Jake Pilla defeats Matt Brady by knockout via Handplant Upkick at :32 of round number one. Round 1: Ray starts the action with a low kick and Jesse walks him down with the jab and gets the takedown. Ray gets back to his feet but Jesse grabs the body lock and lands some foot stomps before picking the ankle and taking Ray back to the mat. Jesse is heavy from top position putting Ray against the fence and doing damage with knees and more foot stomps. Shawdee gives his back and Jesse hops on and has one hook in, Jesse lands some short punches as Ray looks to return to his feet. Ray gets up briefly but is taken right back to the mat but this time he pops back up. Ray grabs a guillotine and looks to finish and ends the round with a powerful combination. 10-9 McElligott. Round 2: Ray starts round 2 with another low leg kick and looks to unleash his hands. Jesse quickly closes distance and scores another takedown as he has Shawdee pinned on the fence. Shawdee escapes and returns to the feet where he sinks in a guillotine and pulls quard on it Shawdee is bleeding from under the right eye as Jesse escapes the choke and starts to work from the top once again. Jesse once again gains the back of Shawdee and is again looking to flatten him out and work towards the finish. Jesse continues to work from the top but cannot secure the choke as the round expires. 10-9 McElligott. Round 3: Ray comes up trying to strike and Jesse clinches and Ray looks to work the body. Ray is starting to throw punches with a sense of urgency now and Jesse clinches and gets the takedown and is again trying to secure the back of Shawdee. Ray returns to his feet but is against the fence, Shawdee turns the action and has Jesse against the fence but Jesse uses a trip to put Shawdee on his back and once again Jesse hops on Shawdee’s back and is again looking to finish. Jesse is peppering the head of Shawdee from the back and looking to finish with heavy ground and pound but Shawdee survives to hear the final bell. 10-9 McElligott. Round 1: Espino comes out with some kicks and George looks to clinch and has Espino against the fence. George grabs the high crotch but cannot get the takedown and now Espino has George pressed against the cage. Espino gets the takedown and George grabs a guillotine attempt on the way down to his back. Espino gets the back of George and gets both hooks in and rolls to his back where Espino looks to work the Rear Naked Choke. Espino is peppering George with strikes from the back, George looks close to tapping before he makes a last ditch effort to roll and ends up on top landing ground and pound. George postures up and lands some heavy shots from the top causing Espino to turtle, Espino gets to his feet as round 1 comes to a close. 10-9 Espino. Round 2: Espino starts round 2 with a glancing spinning backfist to close the distance and clinches George against the cage. George looks for some elbows with his back on the cage as Espino tries for the take down, George trips Espino however and takes Espino to the ground and looks for some heavy ground and pound. Espino gets his feet back but is greeted with a big knee that lands Espino back on the mat. Espino uses the keylock to roll position but George gets back to his feet and has Espino against the cage. George grabs the Thai plum and is landing heavy knees from the Thai position. Espino gets George to the ground and is on top before being swept by the relentless George. Espino gets the takedown and finishes round 2 on top of the grounded George. 10-9 George. Round 3: Both fighters answer the third round bell clearly tired as Espino comes out throwing a variety of kicks. George answers those kicks with some nice counterstriking of his own and Espino slips on the mat, Espino gets to his feet and takes George down and has him in full mount. Espino lands some heavy ground and pound that forces George go give his back, Espino continues to land heavy ground and pound and George is no longer defending himself and John English has seen enough and calls an end to this fight. Decision: David Espino defeats David George by TKO (Strikes) at 3:09 of round number three. Round 2: JR comes out again firing the jab, Vovka slips to the mat and JR gets on top and looks to work from the top now. JR has Vovka pressed against the cage, and looks to do work. Vovka scrambles to his feet but takes some shots to do so. JR presses Vovka against the cage and looks to do work in close. JR backs out and looks to land some shots but Vovka comes forward and looks for a takedown of his own against the cage. Vovka gets the takedown and starts landing short elbows from the top. Vovka remains on top and lands more heavy elbows from the top as the second round ends. 10-9 Coughran. Round 3: JR lands some nice combinations to start the final round but Vovka ducks under and lands a double leg takedown and has top control on JR. JR escapes out the back door and gets Vovka on the takedown but Vovka pops right back up. Once again looking to take JR down and he does. JR gets back up and they return to the center of the cage where Vovka goes for the takedown and JR pulls guard with the Guillotine. JR is cut over his right eye and is bleeding heavily from his eyebrow. Vovka gets on top and sinks in a deep Von Flue choke that gets the tap. Decision: Vovka Clay submits JR Coughran in the third round by Von Flue Choke!